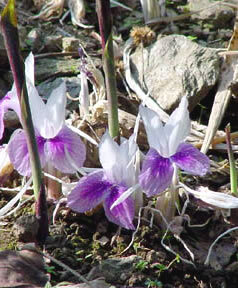 Indian crocus, also known as bhucampaka in Sanskrit, abhuyicampa in Hindi and chengazhinirkizhangu in Malayalam is a medicinal herb with aromatic rhizome. The rhizomes are used for the treatment of tumours, swellings and wounds. It helps to remove blood clots and other purulent matters in body. It is used in many ayurvedic formulations including 'Chyavanaprasam' for improving complexion and curing burning sensation, gastric complaints, mental disorders and insomnia. 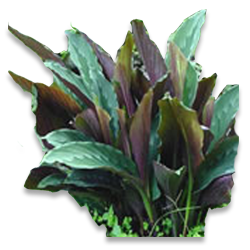 The plant is distributed in the tropics and subtropics of Asia and Africa. 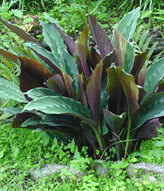 It grows wild in wet, humid or shaded forest ecosystems of south India. It is also cultivated as an intercrop with other commercial crops. Moist loamy soil is ideal for the crop. Laterite soil with heavy organic manure application is also well suited. It is propagated through rhizomes and tissue culture methods. At present, only local types are available for cultivation. The optimum time of planting is with the receipt of four or five pre-monsoon showers in May-June. Plough the field to good tilth. Incorporate organic manure at 10-15 t/ha. Prepare raised seedbeds of 1 m breadth and of convenient length. Use rhizome bits of size 10-15 g for planting. About 2500-3000 kg rhizomes are required for planting one hectare. Smoking the rhizomes for 2-3 weeks is good for the development of healthy sprouts. At times, rhizomes are stored in Glycosmis pentaphylla (panal) leaves in underground pits covered with coconut fronds. Pits are made at 20 cm spacing on the seedbed. Whole or split rhizomes with at least one healthy sprout is planted 5 cm deep with the sprout facing upwards and covering the pit with FYM. Mulch the beds thickly with green leaves or straw @ 15 t/ha immediately after planting and again after two months along with weeding and topdressing. Mulching is absolutely essential for good growth. Fertilizer application can be skipped in fertile soils. In poor and marginal soils a moderate dose of 50:50:50 N:P2O5:K2O kg/ha may be applied; P2O5 as basal and N & K2O in two or three split doses. Remove weeds, apply manure and fertilizers and earth up two and four months after planting, followed by mulching. During rainy months, rhizome rot is noticed which can be controlled by drenching 1% Bordeaux mixture. The crop matures in 7-8 months. Drying up of the leaves is the indication of maturity. Dig out the rhizomes carefully, remove leaves and clean. 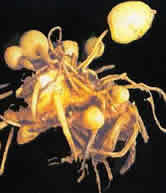 The rhizomes with attached tubers are usually marketed afresh. Prolonged storage may cause insect and fungus attack. The average yield is 12-15 t/ha and dry rhizome yield 27-30%.